In a service environment, documentation is key. When everything is accounted for, the risk of losing revenue decreases, assets increase, productivity improves, errors are minimized, and the cost of maintenance lowers. 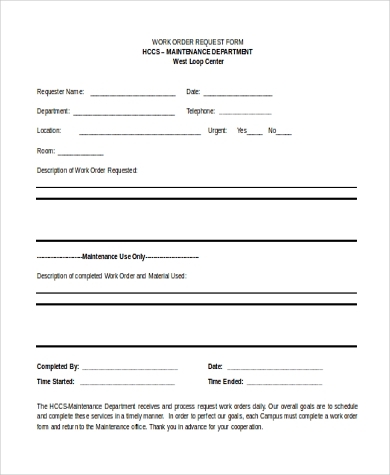 Issuing Work Orders allows proper documentation and tracking of projects, establishing priorities, determining cost and duration, and evaluating mistakes. 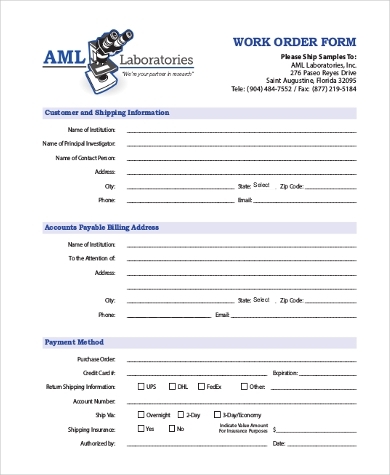 A Work Order is a form received from a client or is ordered internally within an organization. The form issues the formal authorization for the rendering of a service or the delivery of products. Constructing a good work order can be mind-boggling. 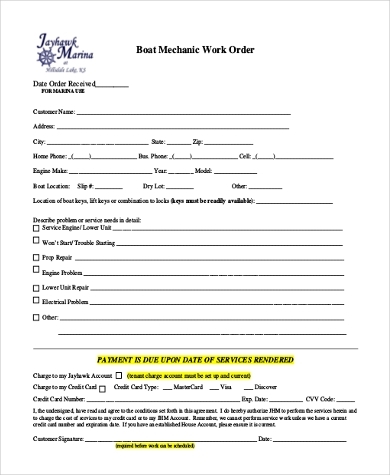 However, our Work Order Forms will help get you started in just a jiffy. A well-constructed work order establishes a good system required in your work force. You can monitor projects, track availability of products, estimate labor and material costs, and delegate resources to accomplish them through work orders. 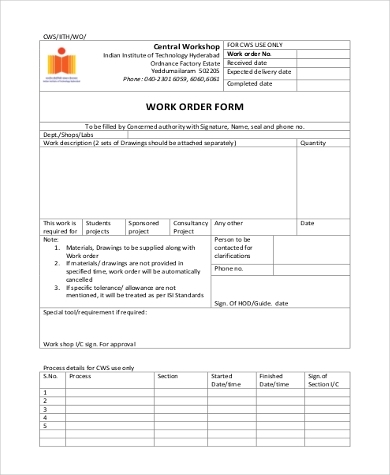 Work orders provide a clear and comprehensive list of the requests that clients made for the project; this gives them tangible proof of who should be accountable for any delays and errors. Work orders are like invoices. They both contain a detailed list of cost is enumerated, including any updates and periodic changes. Multiple changes and delays in a project can have clients worry about its status. A client will be able to see the progress of a project through Work Orders. A company’s success is affected by planning and scheduling elements. 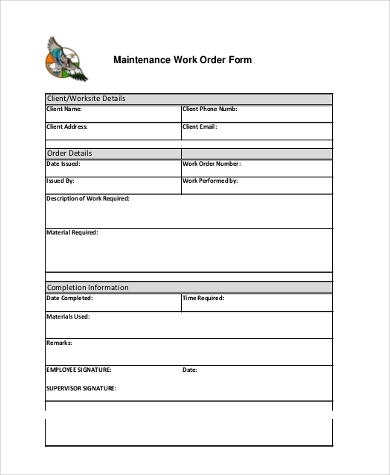 A Work Order Form dictates proper planning and scheduling, especially when changes to the project are made. 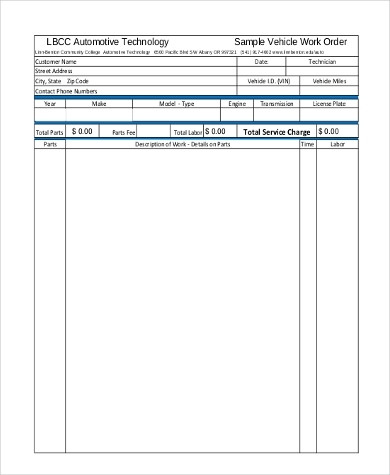 A Change Order Form is completed when work is added or omitted from the original scope of work stated in a contract made. This is done to properly disseminate the new information of the project. A project is completed quicker when there is a well-constructed job order. Not every project is a success. 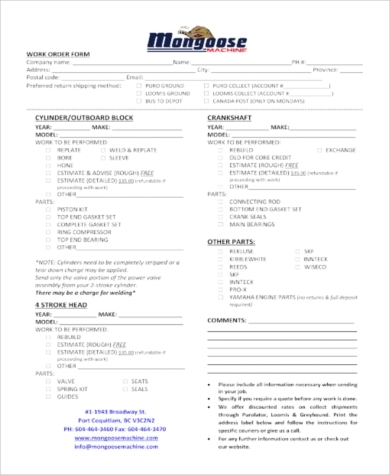 With the presence of a thorough work order form, contractors and clients can assess mistakes, figure out solutions, and avoid future repetition of errors. maintenance personnel are not the only ones who use Work Orders. 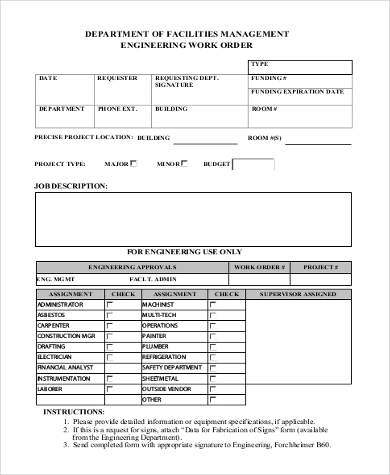 Other departments, such as the Operations Department, Engineering Department, Inventory Personnel, Accounting, and Upper Management must also be involved in utilizing work orders. A Work Order can dictate the success and failure of a work system. It is the cornerstone for the growth and success of an organization, dictates the authorization of production, and serves as a reference. 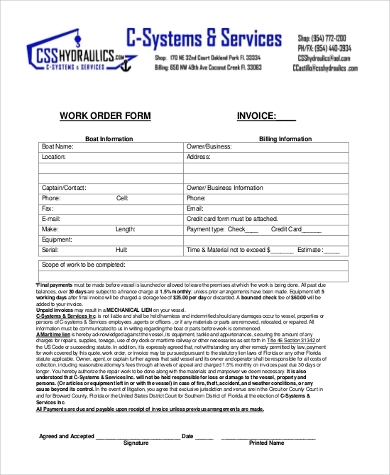 Our varied Work Order Forms, Event Order Forms, and Change Order Forms are a great way for you to monitor your projects and set priorities. 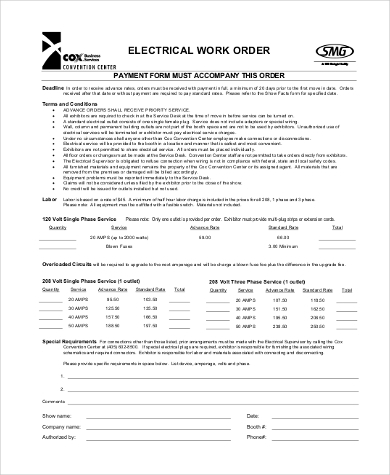 Don’t be bogged down by the thought of having to come up with your own Work Order format. 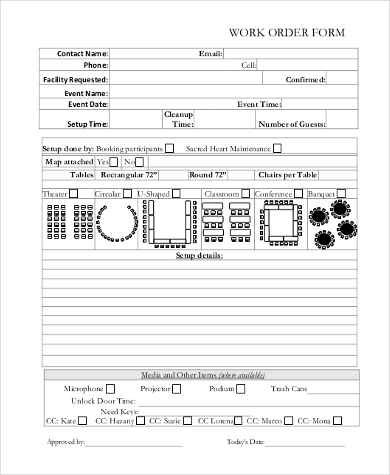 Our free templates may be customized so you can tailor these to your own Work Order Form needs.